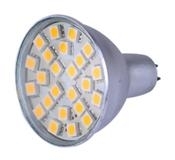 This LED bulb has 27 flat HIGH POWER SMD 5050 leds and is designed for MR16 base. Can be used instead of all halogen lamps for 12V AC/DC. Replaces 50W halogen bulbs and gives the same lightning just with 4W !! !